Located on the Atlantic side of the private island community of Scotland Cay, this 6 bedroom, 6 bath home was built with entertaining in mind, featuring over 3,600 square feet of sprawling deck areas, two fully equipped bars, billiard table, and outdoor Jacuzzi spa. The offering includes the home site of three beachfront lots, totaling 1.8 acres, plus an additional 17,269 square foot lot on the quiet marina known as Coconut Creek. This lot offers 80 feet of harbor frontage to build your own dock, plus the assignment of a 60 foot slip with electric and water in the Coconut Creek marina. 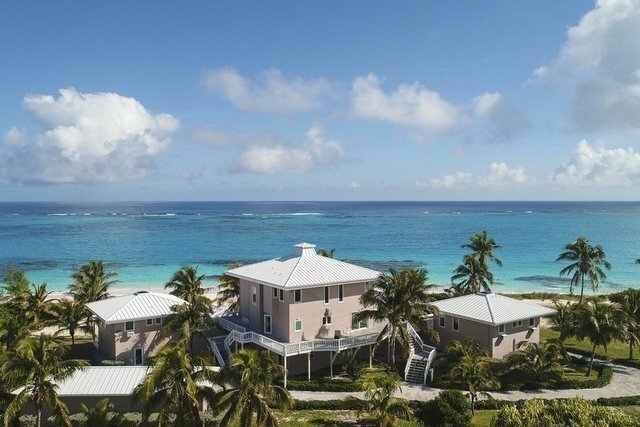 With a commanding view of all 387 feet of powdery white beachfront, each of the bedrooms in this 6,000 square foot pod-style home have en-suite baths, plus two additional half baths just off the main living and entertaining areas. The wraparound decks connect the main house to each of the two guest houses. The main house serves as the central gathering area, including a spacious kitchen with granite countertops and stainless steel appliances, living and dining area with wraparound sliding doors, and fully equipped bar with a fireplace and billiard table overlooking the ocean. The entire second level of the main house is dedicated as the master suite. Complete with his and her baths, the bright and spacious master bedroom features towering cathedral ceilings, a stone fireplace and private living area. Enjoy the views and relax in the comfort of your own lounge area and media room, offering a fully equipped bar and wide second-story balcony overlooking the Atlantic ocean. The two guest houses are thoughtfully positioned on either side of the main house, so as to allow for privacy and unobstructed views. Each guest house has two luxurious bedrooms, featuring vaulted ceilings with skylights that let in an abundance of natural light, large sliding doors to take advantage of the view, and come complete with in-room refrigerators and entertainment systems. On the ground level of the northern guest house, just off the paved driveway entry, is a one-bedroom in-law suite with a full kitchen and living area that serves as staff accommodation or for guests that prefer a little more privacy. The ground level of the main house is a bright and organized laundry room, pantry and workshop. It has plenty of space to stow all your gear, plus built in workspaces, additional cold storage, and commercial icemaker. The large carriage house style garage has room for 6 golf carts, and houses the generator, plus additional storage. Additional amenities include an 80,000 gallon fresh water cistern, impact doors and windows, Jacuzzi hot tub, 40KW standby generator, 80 feet of harbor frontage, and 60 foot dock slip with power and water. Scotland Cay is a private island less than 200 miles east of Florida. With a 3,200 foot paved airstrip and 5 common area parks, this lush and well maintained development is easily accessible by private or charter flights. This fly-in community offers that unique combination of privacy that one would expect from an island, but with the added conveniences of daily ferry service, freight delivery services, and available on-site maintenance services. Scheduled airline flights into Marsh Harbour from the US east coast are available through major carriers and regional airlines. There are 4 scheduled ferry trips (20 minute ride) from Marsh Harbour to Scotland Cay each day, plus freight service to the island 3 days a week. Many retailers offer delivery to Scotland, via ferry or barge to the island, making provisioning a breeze.